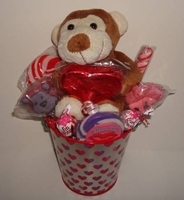 There's no monkeying around with this cute monkey Valentine gift basket. You get a plush monkey sitting in a metal pail surrounded with lollipops. Wrapped in a cellophane bag with gift bow.